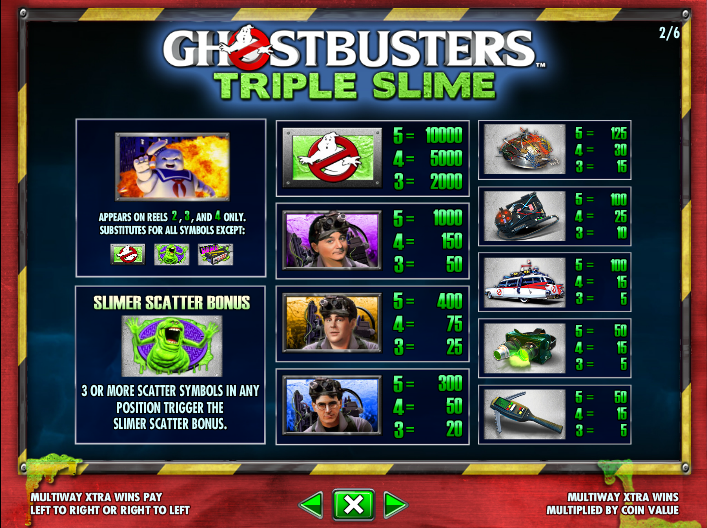 If you’ve ever played IGT’s Ghostbusters online slot then you’ll be pleased to hear that there’s a sequel with the name of Ghostbusters Triple Slime and it’s still based on the original films rather the more 2016 version. It’s full of bonus features related to the movie and you can find out all about them right here. 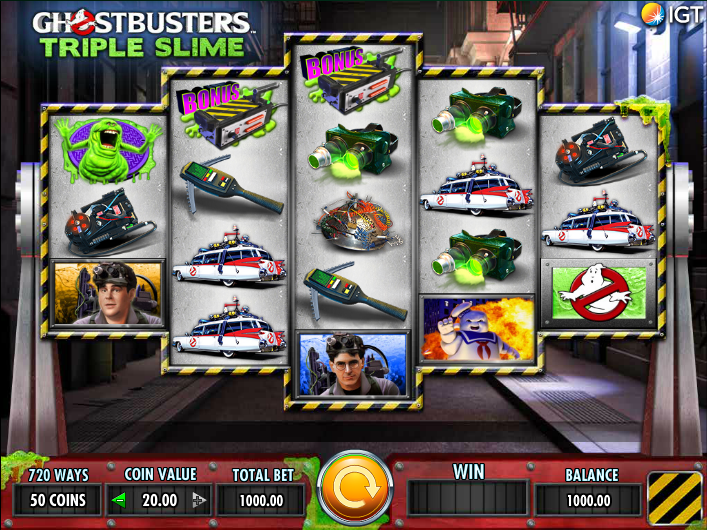 Ghostbusters Triple Slime is a five reel slot with variable rows (as you can see from the screenshot above) and 720 ways to win – wins are formed as long as there are matching symbols in adjacent rows starting from the left hand side. The reels spin on a metal barrier, blocking the route to where all the slimy action is happening. All the symbols are related to the theme and include three of the characters – Egon, Peter & Ray, the car (Ecto-1) and various bits of imaginative ghost busting equipment. The Stay Puft character is wild, appears only on reels two, three and four and will substitute for all others to form winning combos except for the Ghostbusters logo, the slimer scatter and the ghost trap scatter. This is triggered by landing three or more of the slimer scatter symbols anywhere in view and you will now see each of those scatters transform into little Wheels of Fortune displaying multiplier values. Each will spin to determine the total multiplier applied to your stake. Trigger this by landing three or more of the ghost trap scatter symbols anywhere in view and you must now pick a number of ghosts equal to the number of triggering icons. These ghosts will reveal green, purple or red wheel pointers which are then displayed on the matching colour wheels. The green and purple wheels award cash amounts and the red one awards a multiplier of up to 10x. Ghostbusters Triple Slime is a worthy successor to the original game with some updated graphics and animations but the same movie soundtrack to keep you company. The features are well though out and the RTP ranges from 92.00% to 96.08%.